Conference play is now fully underway and we are starting to get into the meat of the season. With the NFL winding down and s March draws closer expect more and more content on the CBB side and as I always mention make sure to stay tuned for additional announcements as we continue to add articles, videos and additional tools centered around our sports betting content. Make sure to follow our @AwesemoOdds twitter account for all the latest. Michigan St at Iowa 7 PM EST FS1 – Life in the Big 10 isn’t easy, especially when you are on the road, as more often than not you are going into a hostile environment against a quality team. That is no different for 6th ranked Michigan State once again tonight as they travel to Iowa City to take on a 16-3 and 19th ranked Iowa Hawkeyes team. Michigan State is rolling having won 12 straight and look to be the class of the Big 10, but linemakers expect a competitive game here with the Spartans only a -4.5 road favorite. It’s not surprising considering Iowa is very good at home and also comes in hot having won 10 out of 11 games. They did already see Michigan State earlier this year, but that was in East Lansing and the game wasn’t even remotely competitive with a 90-68 MSU beatdown. 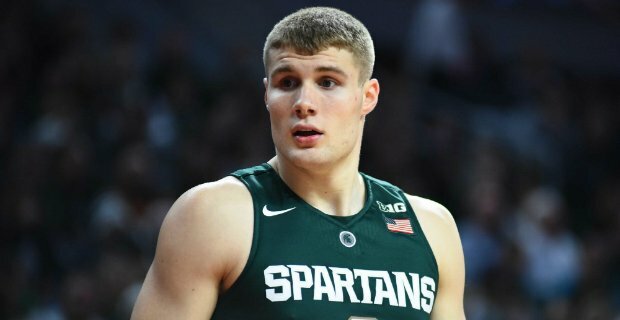 Michigan State should be a little healthier tonight as contributor Kyle Ahrens is expected to return, giving them some additional depth. On the Iowa side they also have a pretty deep rotation, but if they have any shot tonight they need Tyler Cook to have a big game on the inside. MSU is one of the best rebounding teams in the country and if they dominate the glass its going to be a long night for Iowa. Overall this is just another solid test in a stacked Big 10 for a Spartans team who has handled most challenges this year, and it would be a huge win for an Iowa team who isn’t getting a ton of national recognition so far this year. Tyus Battle – Syracuse – $7400 DK – One of the nice things about rostering Battle is you are going to get as many minutes as possible to hit value. Over the last 5 games Battle has sat a total of 7 minutes of game time and that includes playing all 45 minutes of the OT win at Duke a few games back. He basically never leaves the floor and is a virtual lock for 10+ shots each and every night. He doesn’t do a ton in terms of peripheral stats, but the few boards, assists and steals are enough to give him plenty of upside at this price. Cuse is an 8-point favorite against a so-so Miami team, who away from home hasn’t had a ton of success. I expect Battle to lead the way to a relatively easy victory tonight and if he gets hot from 3 he has potential to be a huge DFS contributor without breaking the bank and paying all the way up. Daquan Bracey – Louisiana Tech – $6300 DK – Low key solid matchup tonight in Conference USA with Marshall traveling to Louisiana Tech to take on the Bulldogs. The first thing that stands out in this one is the O/U is 156 which means these teams are going to get up and down and that’s mostly due to Marshall top 10 pace statistics so far this year per Kenpom. This should boost L Tech players across the board and Bracey should be leading the charge tonight if they have any hope of finding a win. The guard is averaging 13.5 PPG and is a decent distributor so the assist numbers can be solid as well. He should easily eclipse 30+ minutes tonight and with all these extra possessions it wouldn’t shock me to see him have one of his best statistical nights of the year vs Marshall. UNC Greensboro -13 – UNCG is battling for the top spot of the Southern conference even though Wofford smoked them earlier in the year. Tonight they are home against the Citadel who comes in at 1-6 in conference play with some ugly losses. The key here is that the Citadel plays at an insanely fast pace and when you combine that with their atrocious D its not unreasonable to think UNCG hangs a huge number of them. I’d expect an easy victory for the home team as they continue to press Wofford for that important #1 seed when conference play comes around I’ll lay the 13 points here with the Spartans. North Florida -9.5 – The UNF Ospreys are an interesting team this year as they have no seniors and played an absolutely brutal schedule earlier in the year so the record is influenced by that stretch. Now they are in conference play in the Atlantic Sun where they have a fighting chance and get a home matchup vs Jacksonville who is in a tailspin. JU has lost 7 of 8 with the lone win being against Kennesaw St who is garbage so they really are struggling and now to go North Florida who is better than you would think when factoring in SOS. UNF also likes to launch the 3-ball and play up tempo so the O/U of 160 shows this game could be very high scoring and I wouldn’t be shocked to see UNF hang 85+ point tonight in route to a double-digit victory over a bad Jacksonville team.